Nope. Can’t say that I remember. 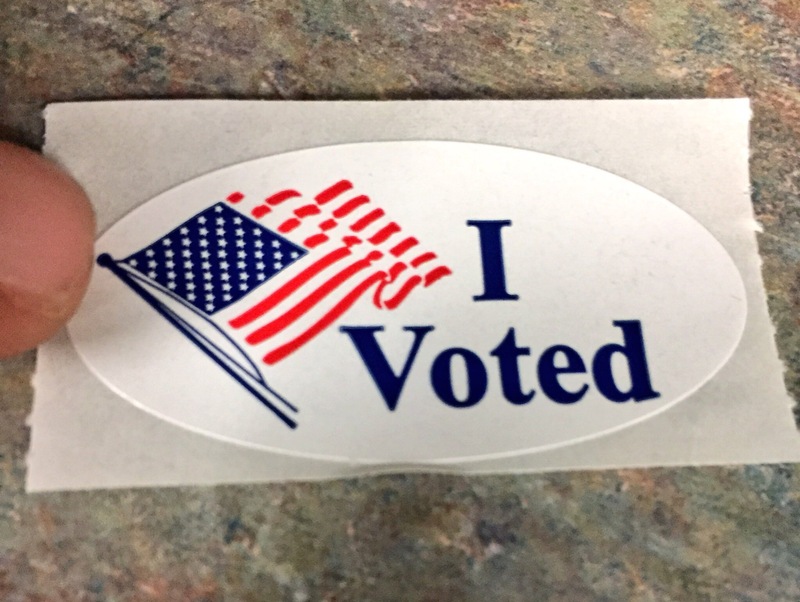 I couldn’t tell you where any of my stickers from previous elections were hiding (if kept); nor have I ever been inclined to take a picture of one. Nonetheless this keepsake is from the recent United States 2016 presidential election. What I do remember is the first election where I was finally old enough to vote! It resulted in the first (and last to date) African-American mayor of New York City, David Dinkins, being elected. I have changed so much since that day; but one thing that has remained the same is my unwavering decision to vote – no matter what. I don’t talk politics. Well usually. I have participated in every election since that first privilege to do so. I remember being excited about having a choice to sound my voice. Kudos to my mother, a young working widow, raising two children in the heart of Brooklyn, New York. One of the strongest women I know, she incessantly stressed the importance of learning how to drive and being registered to vote. So thanks to Mommy; voting (and being a “lead foot” New York driver) is not an option, no matter what. Things here in the United States have been extremely tense and violent while blatant racism is at an all time high. It’s a hostile climate that we often talk to our children about; especially as people of color now living in the southern region. As a family of faith, there was a time my husband and I would alternate leading family morning devotionals with the children before they left for school. Now morning prayer has replaced the lengthy diatribe that would often cause us to lose track of time because the conversations were so rich and quite frankly: we like each other. Fast forward to the current state of our nation and its undeniable affect on religious believers both publicly and privately. These times are pulling on every spiritual deposit that has ever been made into my life as well as in the lives of those in my household. Yet Sundays are still described as one of the most segregated days of the week. It is rare for congregations to be diverse, multi-cultural, and multi-ethnic. Most schools and places of worship tend to reflect one ethnic group, simply based on the demographics of the neighborhood. However the Body of Christ, looks completely different than the local church. There are several who are either not aware of the difference between the local church and the Body of Christ or they have turned a deaf ear and blind eye to what Heaven will look like. I know that there are many heated debates and discussions about the issues at hand. I also know that at the end of the day God is love but we are not seeing very much of that in this hour. One of the beautiful things about love with pure motives is it’s healing properties. The idea of those with polarizing views being able to have civil, vital dialogue without vicious, hateful racist venom being spewed may seem out of reach to many but not to God…no matter what. The sad reality is there are many who don’t know how to “do church” outside of the four walls of the church therefore reinforcing great division amongst believers about many matters, including this most recent election. Being kind and respectful to one another in one’s place of worship, on one’s preferred day of worship; does not necessarily translate to extending love to those who may look and think differently. But it should…no matter what. Where the world may have once looked to the church, both local and universal, for answers; it smirks at its smug toxicity with great disdain. There are also several people who have been greatly damaged, offended or violated by religious entities and so religion and spirituality in and of itself is already a major turn off. It is important for those of us who still believe to remember that this is not a dress rehearsal! From the haughty demeanor of those who are in church 24 hours a day/7 days a week to the embittered hearts of those who are “C.M.E.” attendees (Christmas, Mother’s Day and Easter). From those who attend services out of obligation, though the flame has long diminished; to those on fire for God, abstaining from formal gatherings in traditional settings. This is it. This is real life. The real deal. This is not your cute children’s church play, cloistered bake sales, jazz vesper or annual holiday bazaar. We are daily interacting with and walking by people, who are in real pain. Those who are depressed, scared, suicidal and angry. Dousing the inferno of the prevailing ugliness of racism with racism and religious segregation, as one who claims God as the source of their love, is not love. I believe very strongly that change must come; and as a lover of diversity and the beautiful mosaic of cultures in God’s creation, I’m sickened by the climate we are raising our children in. It is extremely reminiscent of too many of history’s atrocities to name; that ancestors have fought to eradicate. I know the last days are upon us, there is no doubt in my mind but until our last breaths are drawn, believers must deal with the darkness in their own hearts before ever being fully entrusted with the sacred salve so desperately needed to heal the hearts of others. Post election praise must first start at home before its oil can soothe the wounds of the walking wounded. This is not a dress rehearsal. It’s an invitation to the real world and to life unscripted. You were built for such a time as this and are needed because its happening now…no matter what. This. This is truth. This is what we need hammered into our heads day-in and day-out. So many talk about “the good ol’ days”, but do they know what it is that they miss? I think many don’t – I fear many do. I am a white, middle-aged Southern Baptist – unfortunately part of the loudest micro-section of the church calling for things we should never call for. What so many don’t understand is that white middle-aged Southern Baptists do not constitute the majority of the church…nor should we want it that way. Diversity, like you wrote here, is what the true church looks like. Every Nation, Every Tribe, Every Tongue – all for the One True God. (By the way, the most common language spoken in the Universal Church – contrary to what many of my ilk believe – is not English. It’s Spanish, followed by a rich blend of languages from the world over.) We need to get this right. But, we’re afraid. I don’t even know if we know what we’re afraid of any more. Well said Russell! Always good to hear from you! Next Next post: NEW 2017 SERIES FEATURING INSTAGRAM POETS!